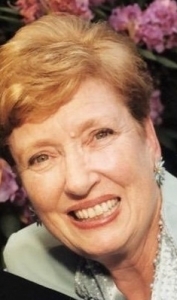 Dolores Behl Garvey, 90, of Sea Isle City, NJ formerly of Springfield passed away on September 28th. Dolores was born and raised in the Roxboro section of Philadelphia before moving to Delaware County. She attended Holy Saviour School and then went on to graduate from Notre Dame High School with the class of 1946. Dolores was a woman who was dedicated to her home and family. She was an avid golfer and a member of Wildwood Country Club. She was also a devoted member of St. Joseph’s Catholic Church in Sea Isle where she belonged to the Catholic Daughter’s group. She was predeceased by her husband, Thomas J. Garvey, Jr. (2000), grandson, Patrick Garvey; daughter-in-law, Joanne Foy Garvey; brother, Robert Behl. She is survived by her 6 sons, Thomas (Louann), Michael (MaryAnn), Terrence (Mary), Joseph (Joanne), Patrick (Sue), and James (Denise) Garvey; sister, Joan Behl; brother, James Behl (Carol); 9 grandchildren, 3 great-grandchildren. To the Garvey family, I am so sorry for the loss of your mother Delores. We had a lot of good times working at Strawbridge & Clothier. Dolores was a lovely lady. She was always attending Mass, either at St. kevin’s or St. Joe’s in Sea Isle. I am glad I k ew her. I am so sorry I missed her Mass. I didn’t know she had passed away. Our condolences to her wonderful family. To all of you guys, I loved your Mom. She was as cool as a fighter pilot, and she had to be, raising all of you. She was always optimistic, funny, positive…a model adult for her kids and grandkids. She was a great Aunt, always interested in what you were doing and how your family was. She married into the Garvey family, which took something. We here in St Louis are thinking and praying for you , your Mom doesn’t need any prayers, she already did her good work. To all the Garveys: I’m so sorry for the loss of your mom, she was a very special person. I have many fond memories of her and she will surely be missed. My deepest sympathies. I am so sorry for your loss. The Garvey family is in my thoughts and prayers. It was my pleasure to meet Dolores as a fellow golfer at Wildwood Golf and Country Club.She was gentle, kind, always friendly and upbeat. We did not know each other well but it was a delight when we discovered that we had family members who worked together. We grieved with Dolores when she suffered the loss of beloved family members and we now find solace knowing that she grieves no more but is joined with the loved ones who predeceased her. Jim, Joe and family, my condolences on the loss of your mother. You are in my thoughts and prayers. I have no words to make this better but please know the entire Garvey family and their loved ones will be in my thoughts. Delores was like a second mom to me. Hugs and prayers. To Joe, Jim and family, I am so sorry for your loss and will keep you all in my thoughts and prayers. You guys are a great testimony to a great mother! My condolences for your loss, take comfort that your mom is in a better place. Sorry to hear about your Mom. We will be thinking about you and your family during this difficult time. To the entire Garvey family, You all have my deepest sympathy. Your Mom was a Wonderful woman and will be greatly missed! I have many many fond memories of her during the Strawbridge days and definitely summers down the shore she as well as you all have shown my family much kindness filled with a bunch of Great memories!! My thoughts and prayers are with you all!! Joe, we are so very sorry for your loss. Please know our thoughts and prayers are with you and your family during this most difficult of times. My Aunt Dolores was a very remarkable woman. One of great strength, determination, and a very positive and upbeat spirit. It takes a special woman to bring 6 fine men into the world. My thoughts and prayers are with all my cousins and their families. However, she is not gone, she just has a new address and one that spells eternal bliss. Heaven is celebrating an extraordinary new tenant. I think she will find the accommodations eternally better than any thing she has seen on this earth. She is well deserved of the crown of life. She will be very missed by anyone that was blessed to know her. My condolences to you Terry (and Garvey family and friends). May God give you the peace that only He can give during this time. My thoughts and prayers are with you. I am so sorry for your loss. My prayers are with the Garvey family. be to see her BEST friend again! My deepest sympathies to the Garvey Family! My thoughts and prayers are with you! To Jim Garvey, Joe Garvey and the family. My condolences to you on the loss of your mother. She has obviously done a great job as you are living proof. I pray for you all as you grieve through this time. Our mother, Dolores, was the unwavering rock and foundation of our family. It is because of her that our tight family bonds are evident to everyone who knows us. May God continue to bless us with her life lessons and may her strength and courage be remembered is in all of our hearts and minds where she lives with us forever.